The Town of Newmarket is pleased to announce that it has entered into an agreement for the purchase of approximately 11.6 acres of land at the north west corner of Mulock Drive and Yonge Street, known to the community as the Mulock Farm/Estate. The vision for this property is to create an iconic community park/outdoor green space. The inspiration comes from iconic parks such as Central Park in New York and outdoor skating trails such as Gage Park in Brampton or the Arrowhead Ice Trail in Huntsville. The cost of the property is $24 million and will be financed through responsible debt financing. 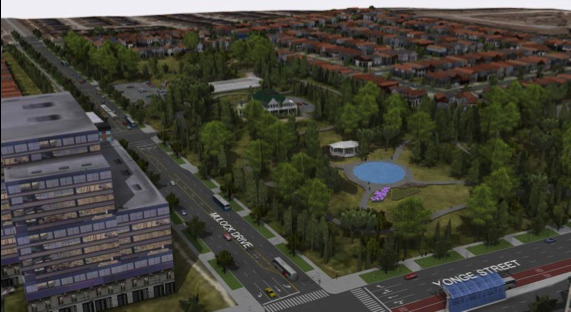 The above photo is an artists rendering of the Mulock Estate. This inspiration comes from iconic parks like Central Park in New York and outdoor skating trails like Gage Park in Brampton or the Arrowhead Ice Trail in Huntsville. The plans for the property will be to offer both passive and active recreation opportunities. In the summer months, the rink and skating trails could be used for various sports and walking/biking trails. The residence that exists on the property is designated under the Ontario Heritage Act. It will be preserved by the Town and considered for uses that will best serve the community. Through extensive public engagement came the creation and adoption of Newmarket’s Urban Centres Secondary Plan, which guides the redevelopment of the Yonge Street and Davis Drive corridors over the next 25+ years and designates the majority of this property as parks and open space. This is a key location within the intensifying urban centres and will provide much needed recreation and activity space in a part of town that will be the second most densely-developed area at full build out. Timelines for construction, access and a site tour will be confirmed in the future - until then, please refrain from visiting the Mulock Farm/Estate.